This week we are working on making a new mould for the Royal Academy of Arts project. 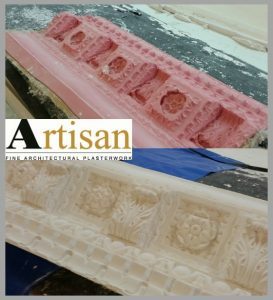 Our craftsman has taken a squeeze of an enriched cornice on site (shown in image below) and from this squeeze we have cast a positive impression in the workshop (seen in image to left). The next steps are to clean up this positive impression using hand tools before we make a mould from which we will cast the required number of lengths of cornice. The enriched cornice is made up of modillion blocks, corinthian leaf, egg and dart, dental blocks, rosettes and lambs tongue features. The enriched cornice is to be featured in the ticket office and cloakroom in Burlington House. We will share a photograph of the cornice in situ once we have installed the finished product.